In 1945 when the atomic bombs were dropped in WWII, our "protectors" and "watchers" in outer space saw that Earth was on a collision course with disaster. The prime directive of non-interference prevented them from taking any action, but then they came up with a brilliant plan to save Earth and assist her in her ascension. They couldn't interfere from the "outside," but maybe they could influence from the "inside." So the call went out for volunteers to come and help. "Earth is in trouble - who wants to volunteer?" The native souls living on Earth were too caught up on the wheel of karma. The only hope was to ask for pure souls to come who had never been trapped on the karmic cycle. Dolores in her hypnosis work has discovered three waves of these volunteers. Some have come direct from the "Source" and have never lived in any type of physical body before. Others have lived as space beings on other planets or other dimensions. Because all memory is erased upon entry to the Earth dimension, they do not remember their assignment. Thus these beautiful souls have a difficult time adjusting to our chaotic world. These souls have a vital role to play as they help all of the rest of us ascend to the New Earth. * What is the New Earth? * What is the Significance of 2012? 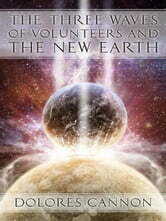 This book provides the background on how the Mother Earth have come to the end and the new beginning. This was an excellent read, full of fascinating and high-vibe concepts that really resonated with me. I recommend this book to anyone who wants a panned-out perspective of humanity, Earth and the Cosmos. Je viens de finir ce livre! Excellent livre, pour qui veut voyager dans l'imaginaire et philosopher sur la vie, l'expérience, les concepts de la vie au delà de la terre.